Every parent wants the best for their child. Whether it’s opportunities, or simply a healthy lifestyle, you want to do all you can to set your child up for success. One way to help build healthy habits for a healthy future is by focusing on your child’s dental care at home. As soon as your child’s first tooth erupts, it’s time to start caring for that tooth. That means brushing, flossing, and making regular dentist appointments. Here are some of the steps you can take at home to improve the quality of your child’s dental care. There is a technical element to home care. 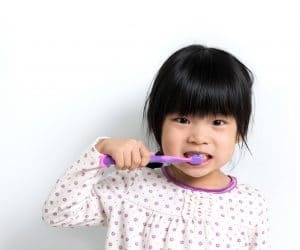 Knowing and practicing the proper technique for brushing and flossing, and using the right tools helps your child care for their own teeth. When brushing, make sure your child is reaching every surface of every tooth. You should also be sure that they’re brushing around the gum line to prevent bacterial buildup. Choosing a flossing instrument that your child will actually use — whether it’s individual picks or string — is the most important consideration. Additionally, you should make sure your child’s tooth brush is soft bristled and small enough for their teeth. I addition to the technical side of home care, there’s also the broader approach that you take. It’s important that you, as a parent, explain to your child the value of caring for their teeth. Poor habits now could lead to cavities and significant structural damage later. Establishing routines, like brushing at least twice a day, keeps your child on track with their home care. The habits they form now can carry over to adulthood. A strong oral healthcare routine can do your child a lifetime of good. Establishing your home care routine is a vital part of the process, but so is working with a professional. You’ll want to make sure you’re scheduling biannual dentist appointments for your child. These appointments give the dentist a chance to examine your child’s teeth and make sure that they’re developing as they should be. When your dentist is able to spot a problem early on, he or she can offer a corrective solution. Taking a preventive approach to children’s dentistry is the best method. If your child needs a dentist who provides comprehensive care from a young age, trust Greenhaven. The friendly staff members at Greenhaven create a welcoming environment for younger patients, helping them feel comfortable with dentist visits. To schedule an appointment for your child, contact Greenhaven Family Dental in Baxter, MN at 218-454-0523.